The First Thursday Art Walk in the historic Pioneer Square neighborhood is a popular Seattle institution. The first Thursday of every month, museums and galleries downtown keep their doors open late, admission fees are waived and studios welcome throngs of art enthusiasts. It’s a popular time for shows to open, and last Thursday was no different. My destination: Gallery 110, for the opening of its outstanding annual juried exhibition. Guest juror Nora Atkinson, the curator of the Bellevue Arts Museum, selected 23 of the freshest, most original pieces from this year’s 540 submissions, which represented the work of 179 contemporary artists from around the globe. The result? A jewel of a show that assembles (relatively) traditional paintings, prints and photography, as well as embellished found objects, 3D prints made of nylon and elaborate architectures built of matchsticks and driftwood. What unifies these pieces is mastery of execution, beauty and, often, profound narrative depth. For example, West Seattle painter Patricia O’Connor’s oil on canvas, Documenting the Future, offers an enigmatic view of the Sound with a solitary container vessel, “Hyundai” emblazoned on its side. Carletta Carrington Wilson’s mixed media piece, Blood’s Fruit is the Palace of Morning, meanwhile, delves into the past, referencing the Madagascar slave trade in overlapping layers of cloth and beads and old maps. As I make my way through the exhibition on opening night, I am struck by another point in common between these artists: Their palpable enthusiasm. Wilson and O’Connor hold court around their works, chatting animatedly to visitors. The artists I meet all live in Seattle now, but the majority worked or studied elsewhere before finding a thriving arts community here. Seattle native Jenny Riffle, for example, studied at the School of Visual Arts in New York before returning home. Her contribution the show, “Sorting Change,” an evocative photograph of a young man combing through a pile of pennies in his apartment, formed part of an art-school project on the theme of treasure-hunting. 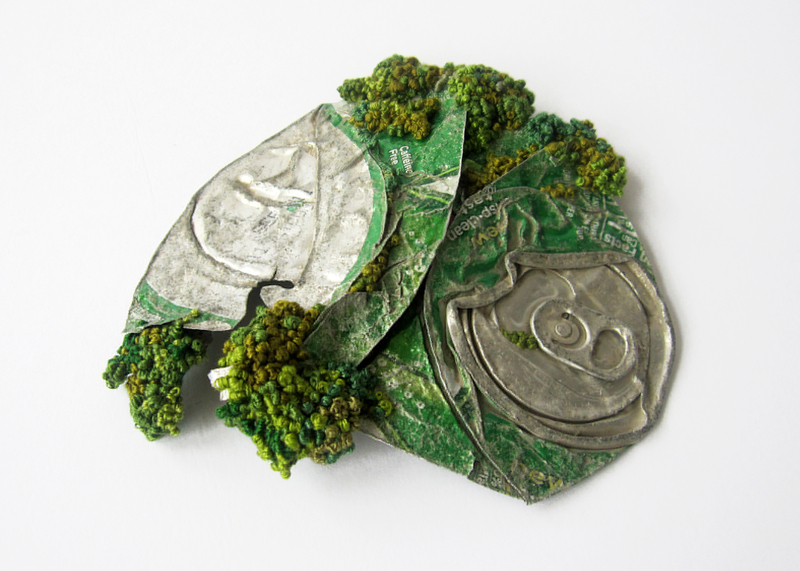 Another New Yorker finding her creative footing in Seattle is Claire Taylor, who turned a crushed aluminum can she found into a tiny masterpiece overflowing with intricate green French knots, contrasting the handmade with the manufactured, the organic with the mineral. Her work, entitled, But It Was So Delicious Wasn’t It Though, nabbed the jury first prize. For almost a decade, Gallery 110 has been showcasing contemporary works by emerging artists and fostering links between its member artists and the broader arts community. Every month, the not-for-profit gallery puts on a new solo, group or thematic exhibition, and it’s a First Thursday fixture. Be sure to catch Gallery 110’s 2012 Juried Exhibition before it ends on Feb. 25. To learn more, see http://www.gallery110.com/. For more information about First Thursday, visit http://www.firstthursdayseattle.com/. 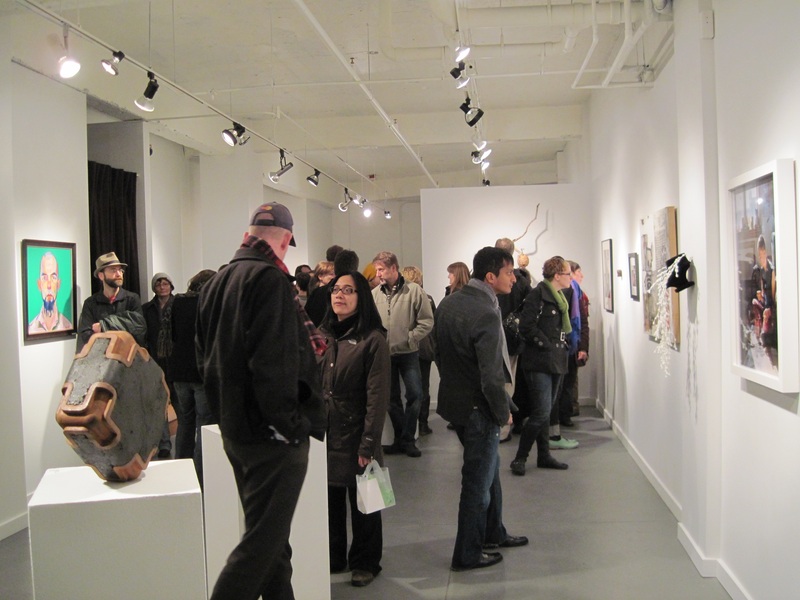 First Thursday opening of Gallery 110's 2012 Juried Exhibition. Photo by Elisa Mader.